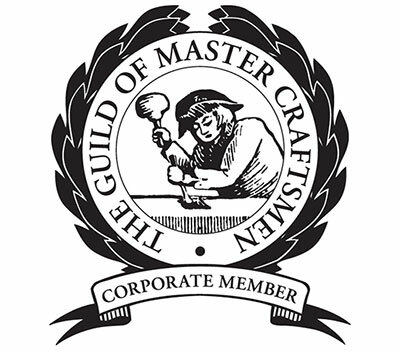 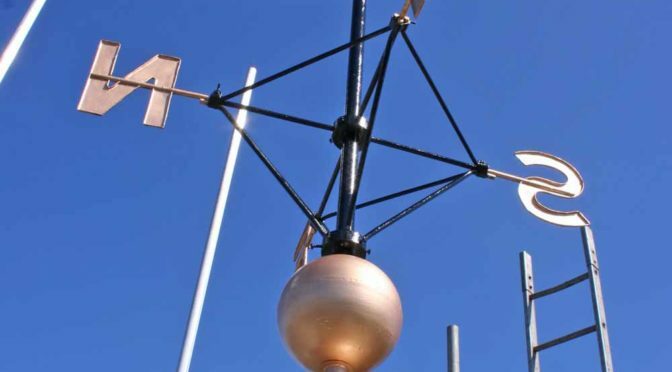 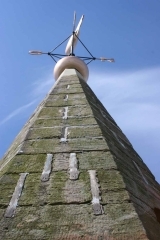 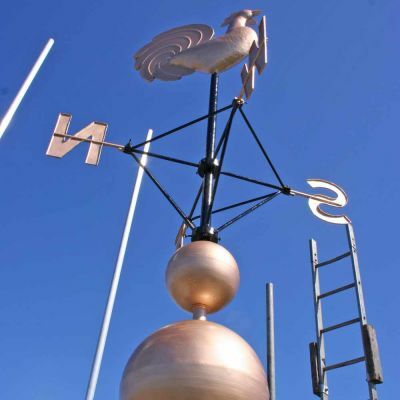 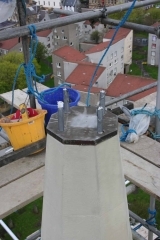 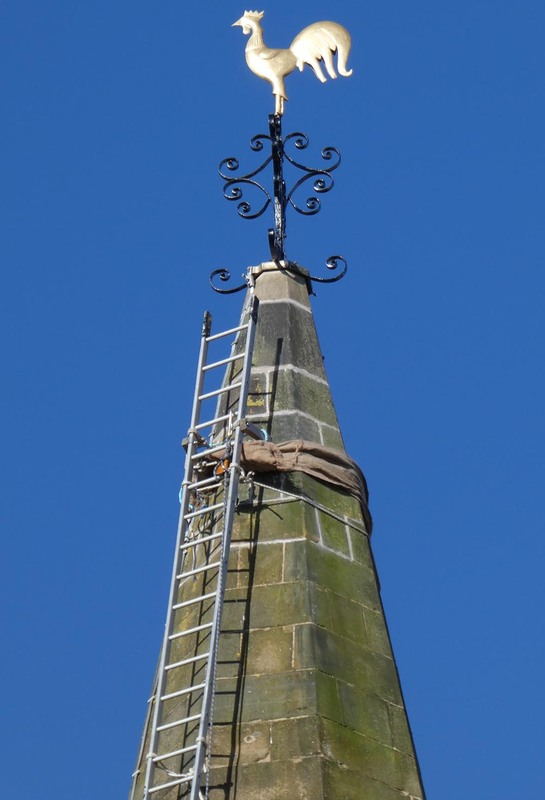 In Order to make the slender upper area of a spire stable, it is necessary to install a “centre rod” which is attached to the bottom of the finial (weathervane). 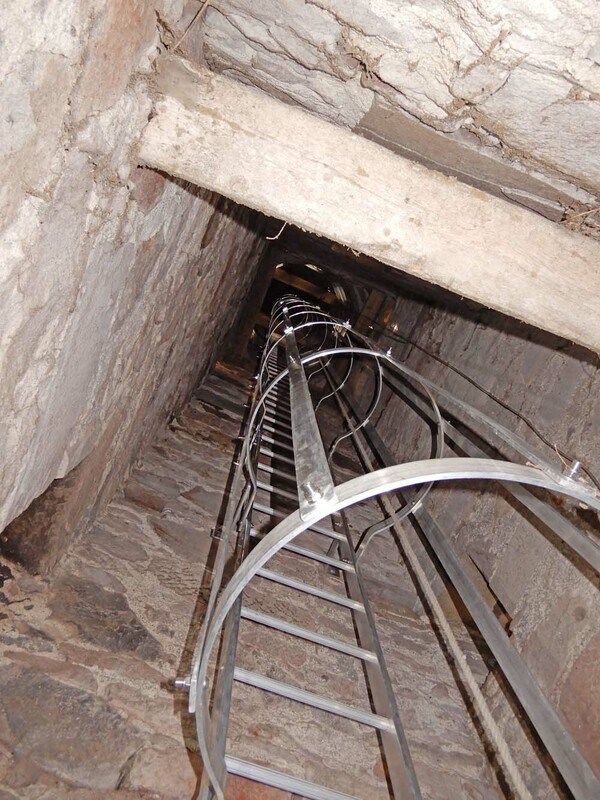 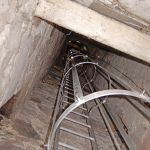 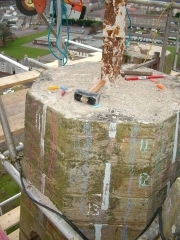 This centre rod then drops a significant distance down the inside of the spire and bolts down securely into a beam known as a “cross tree”. 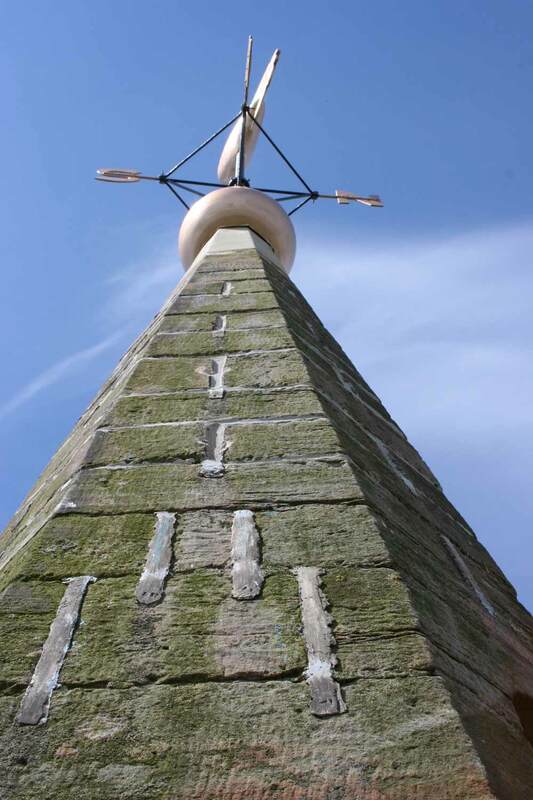 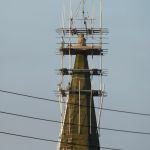 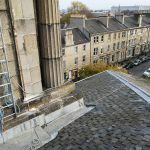 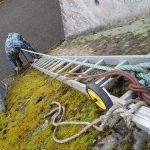 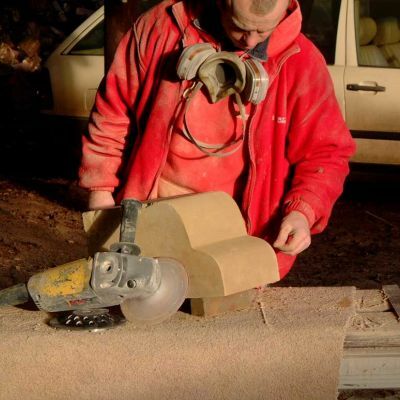 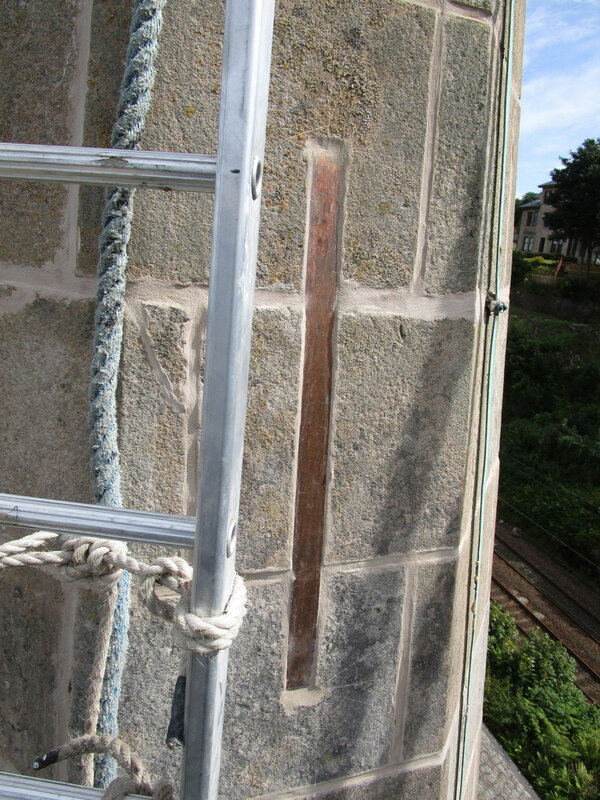 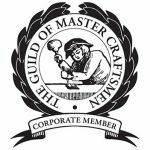 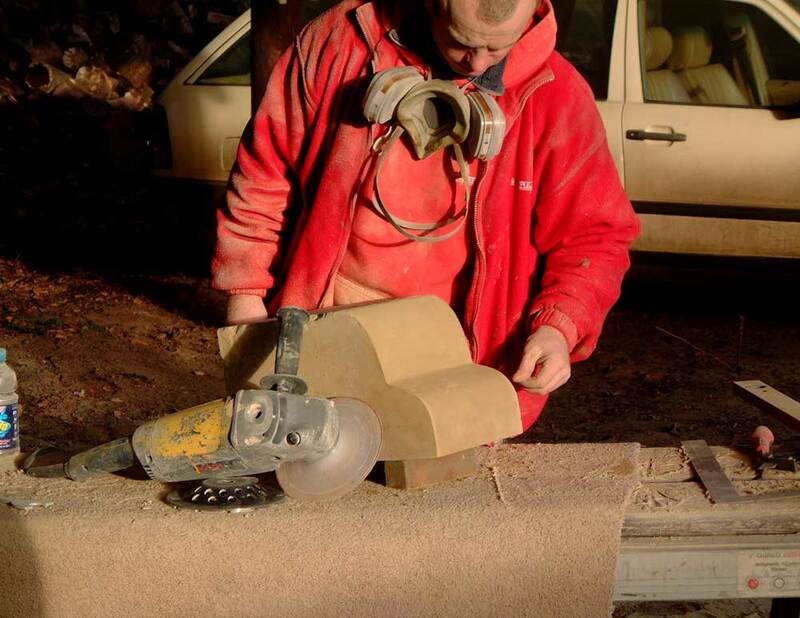 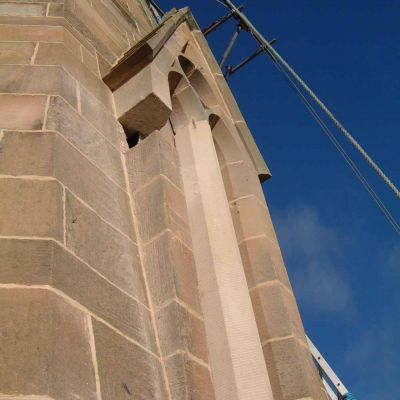 This puts the area of masonry between the summit and the cross tree into compression, and makes the top of the spire effectively a single unit, with a low centre of gravity, which results in very good stability and resistance to high winds. 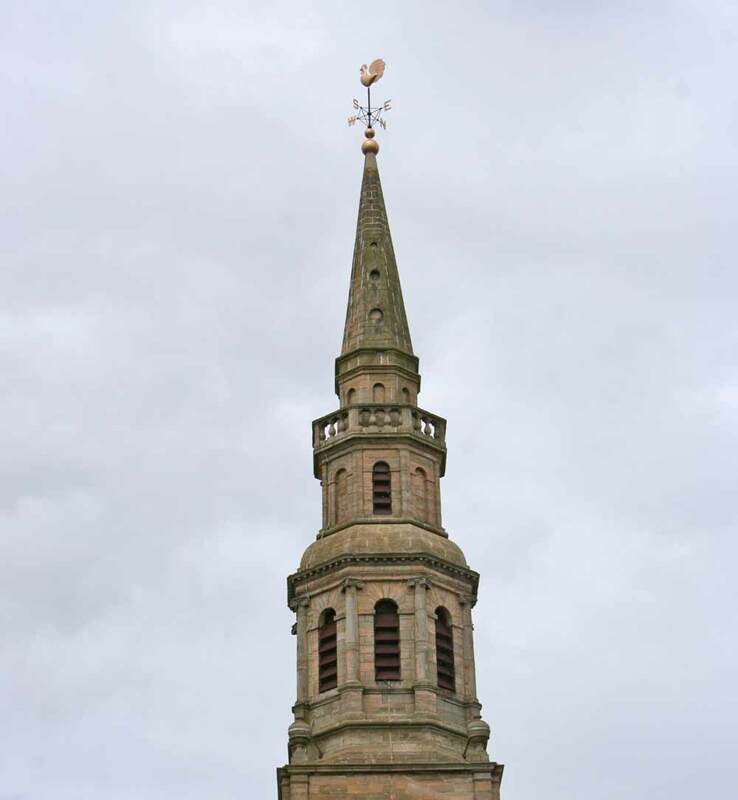 This spire did have a centre rod, but it was anchored very close to the top of the spire (about 6 feet), and the finial attached to the top was unusually heavy. 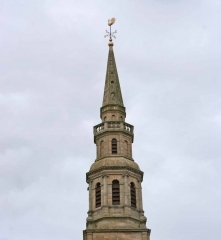 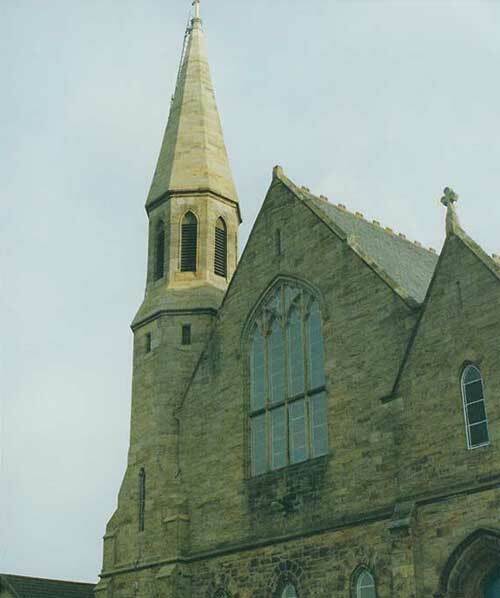 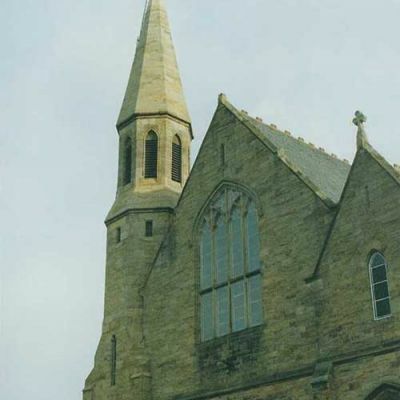 It was immediately apparent that the spire was vulnerable to high winds, so we specified replacement of the finial with a lighter and more attractive version (a copy of the original finial which had been removed some years before) made of stainless steel and copper, and a stainless steel centre rod that would drop 30 feet down the inside of the spire and attach to a new stainless steel cross tree beam. 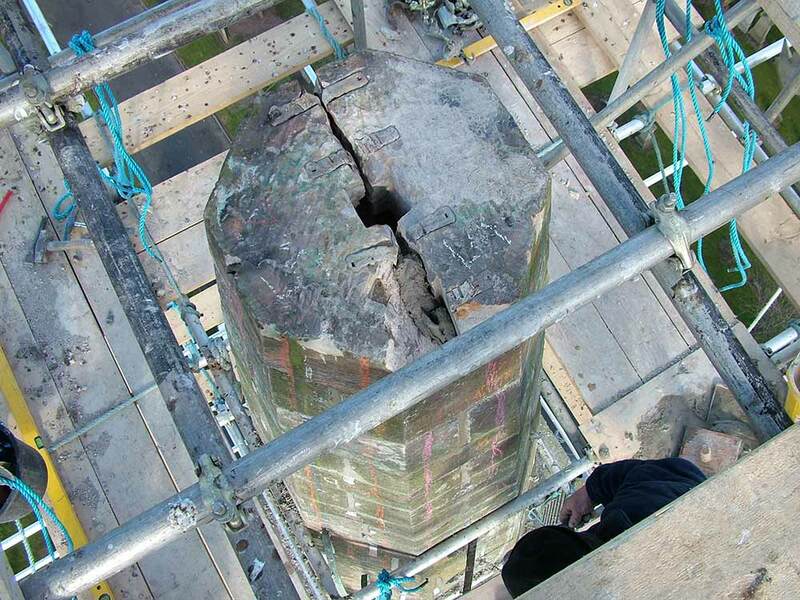 Make safe the 2 ton bell inside the steeple by temporarily suspending it from lifting tackle, remove the existing (badly corroded) hanger mechanism, install a new suspension point for the bell, and attach the bell to it. 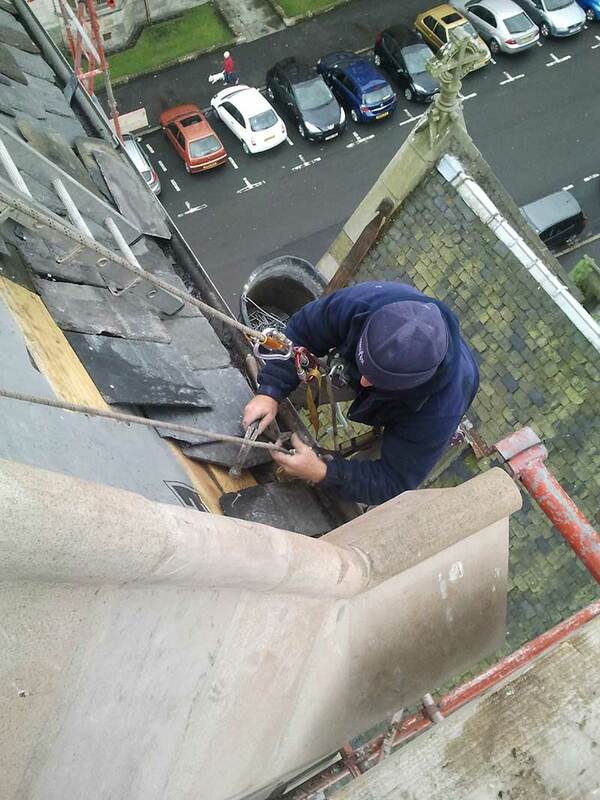 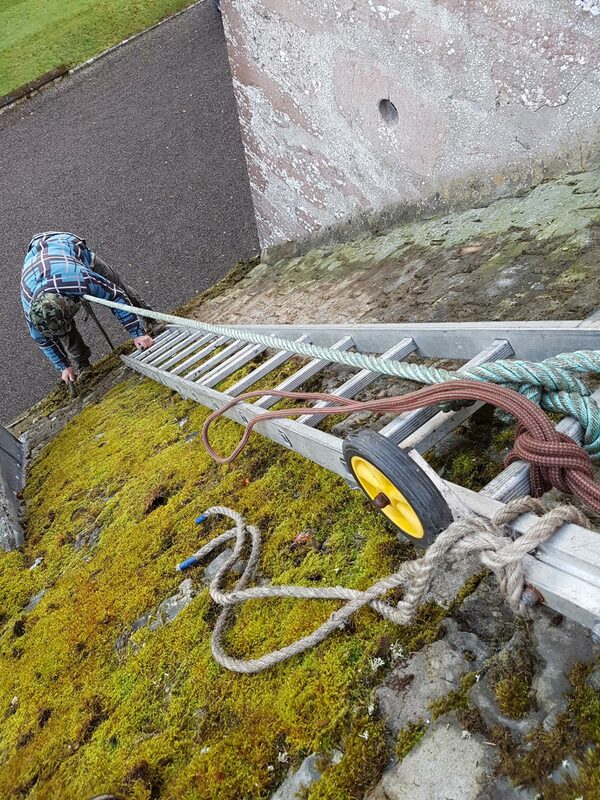 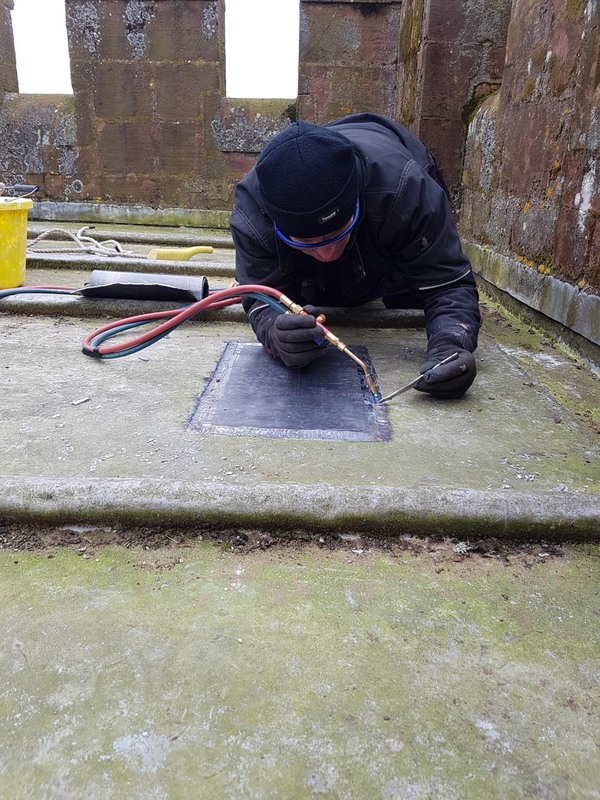 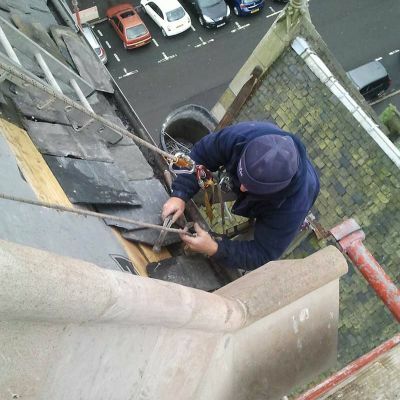 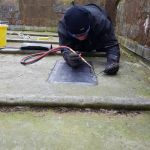 Carry out slate patching on the church roof. 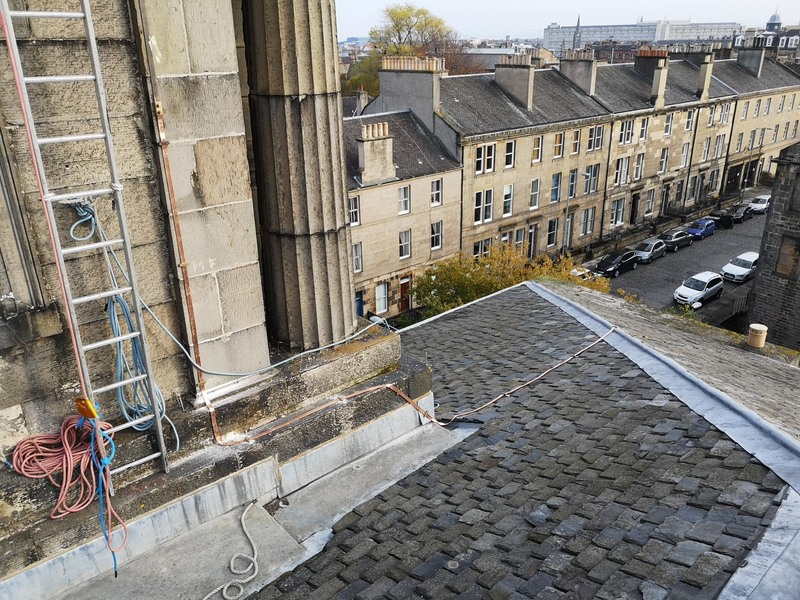 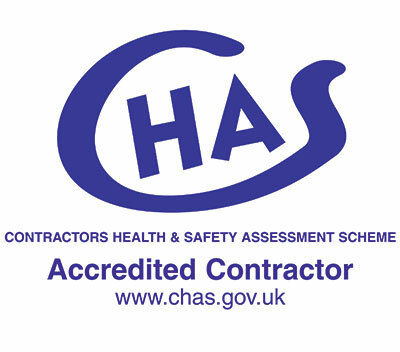 Fit new gutter clips to the existing main roof gutter, which was previously held by badly corroded and unsafe clips. 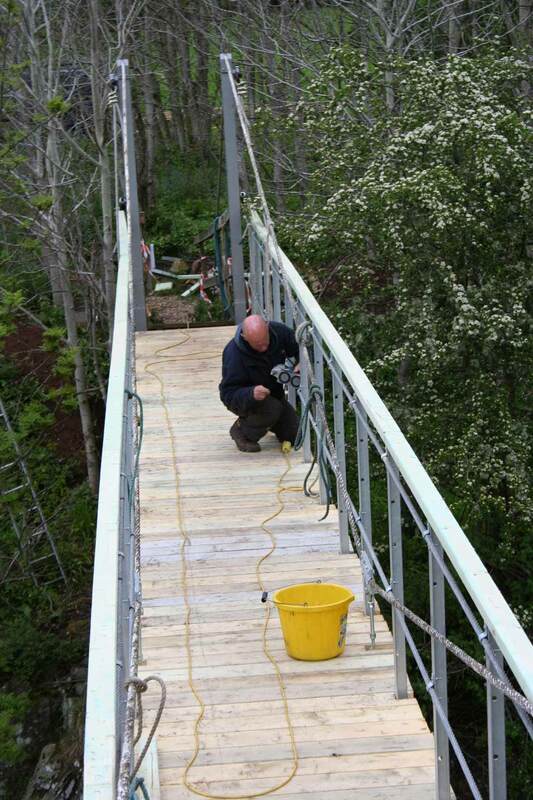 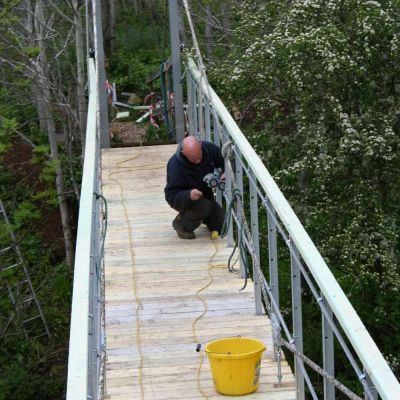 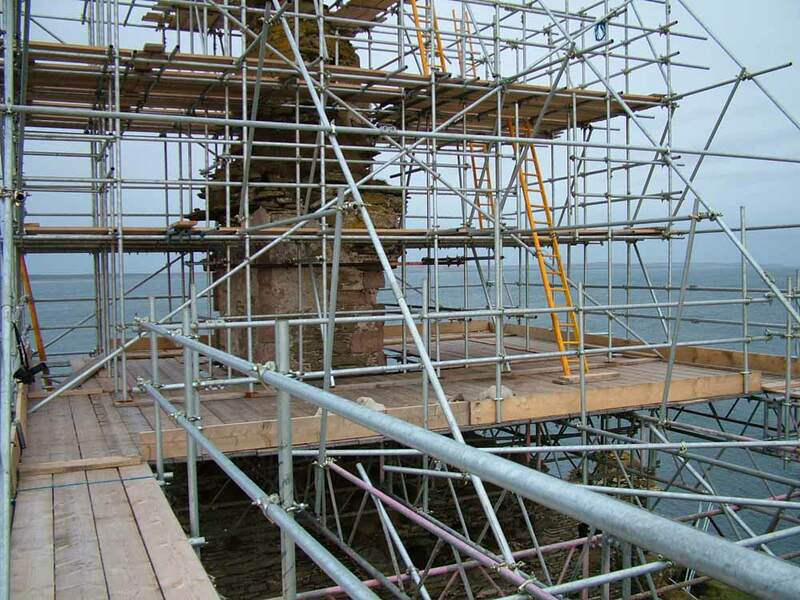 This picture was taken near the beginning of the scaffold (during the scaffolding phase). 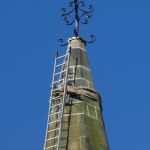 The old finial and cockerel can be seen here. 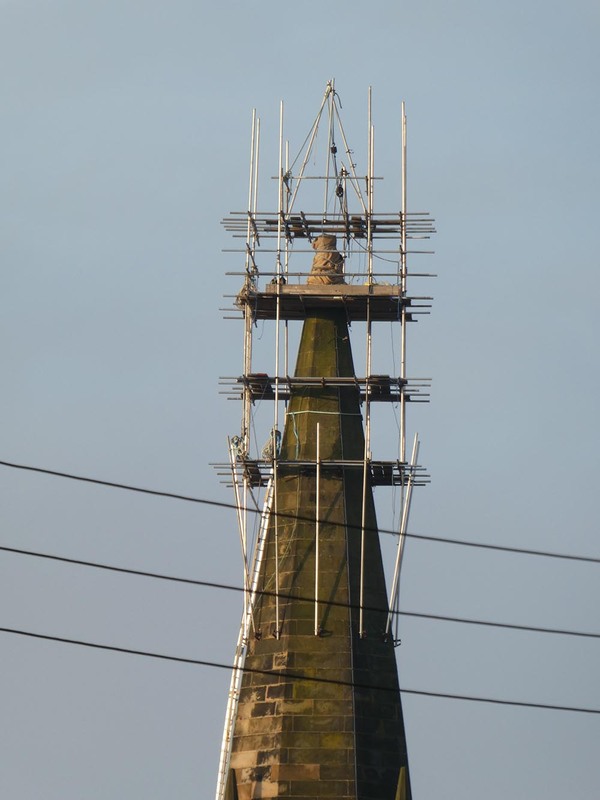 The rust that can be clearly seen on the centre rod here would eventually have caused the head of the spire to crack up due to the expansion of the rusting metal. 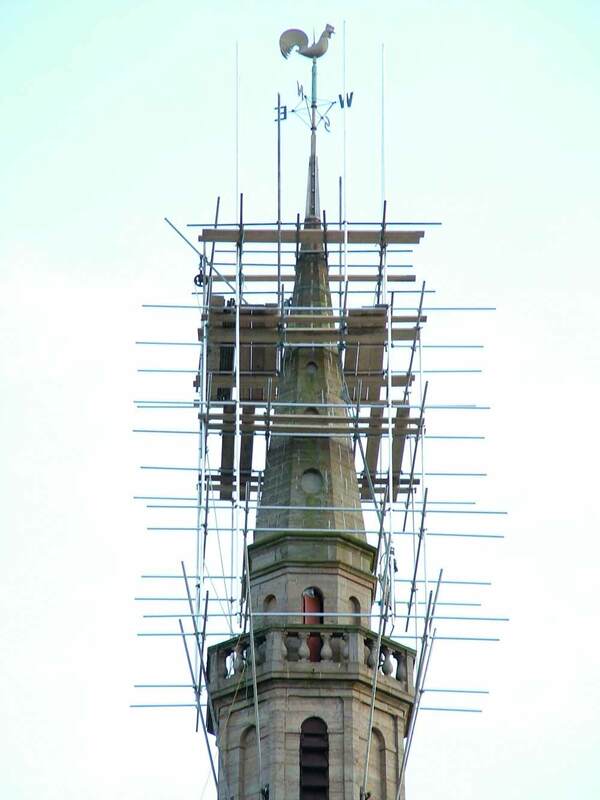 This is known as “rust-jacking”. 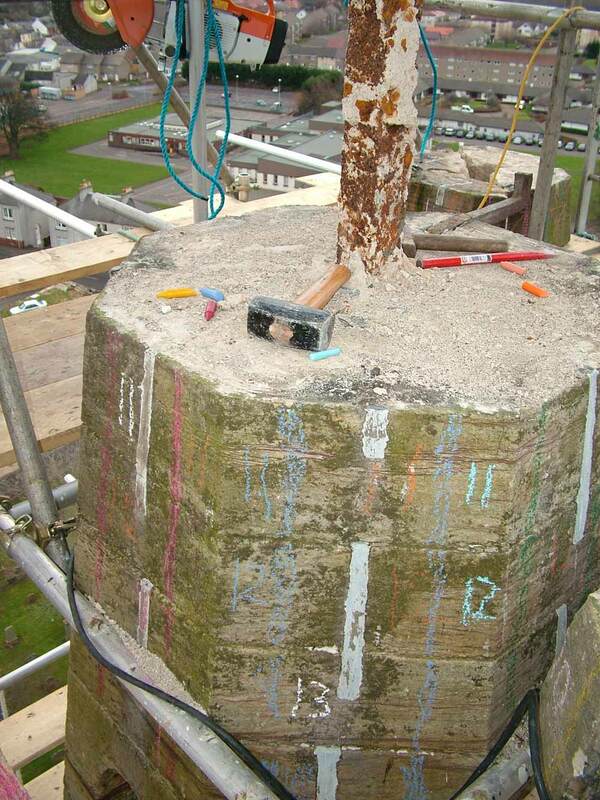 The markings on the stone allow us to see exactly where the stones need to go once we start rebuilding. 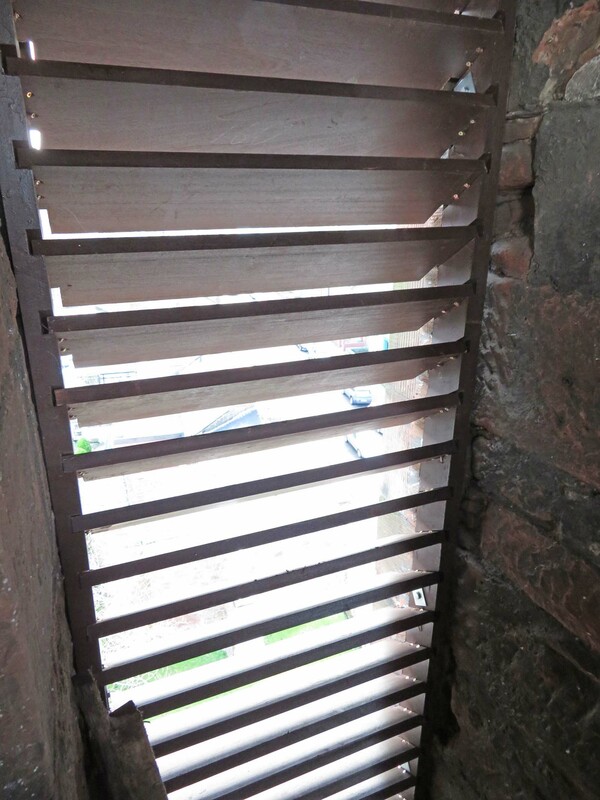 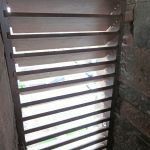 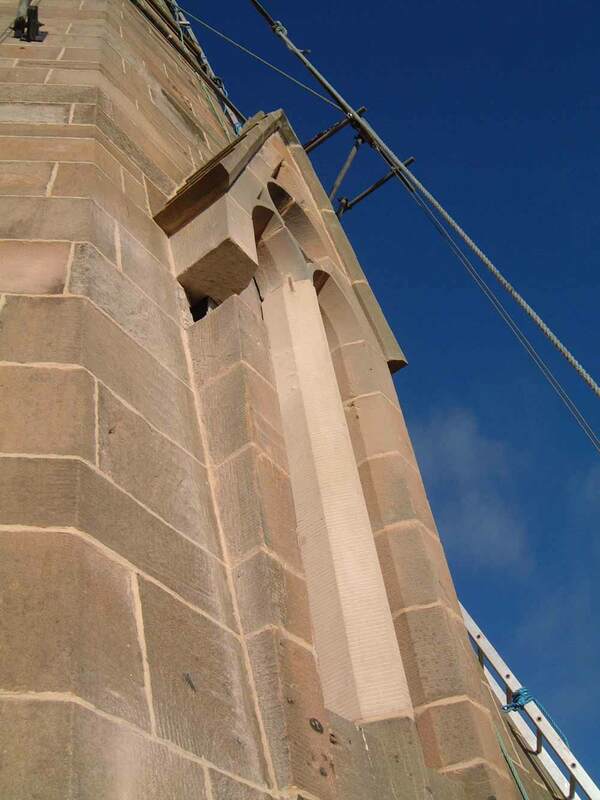 All of them were cleaned off completely once rebuilding was completed. 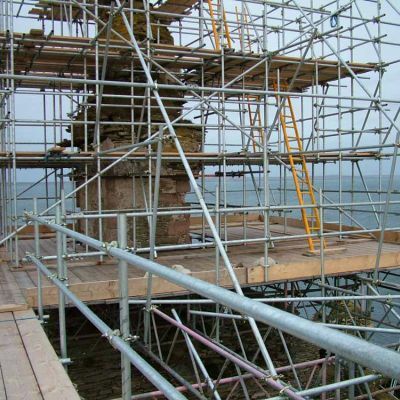 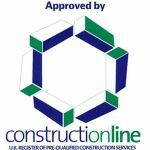 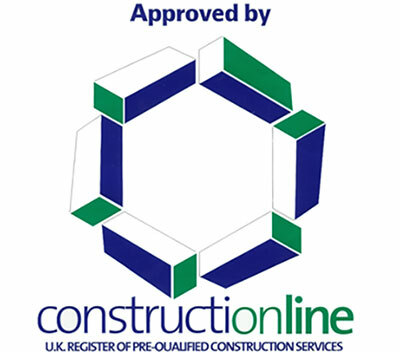 Part way through the rebuilding phase. 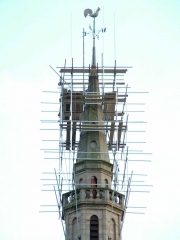 The spire is now fully rebuilt. 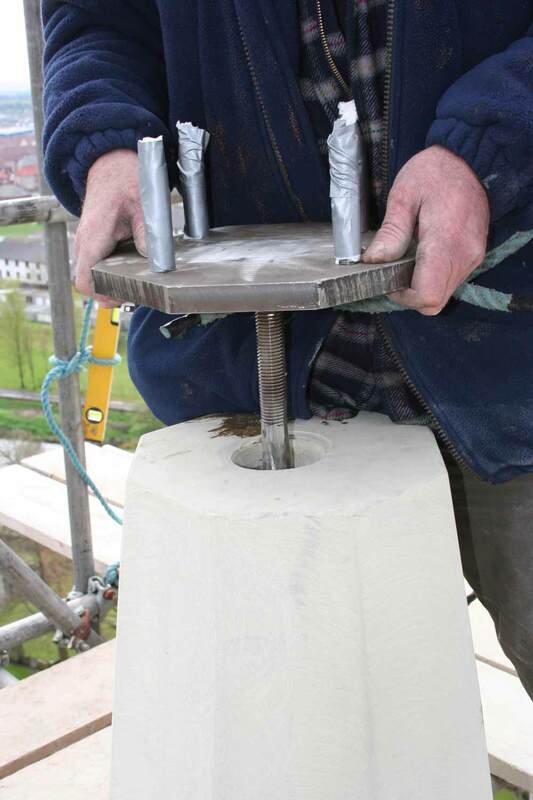 This picture shows the compression plate / centre rod assembly almost completely inserted. 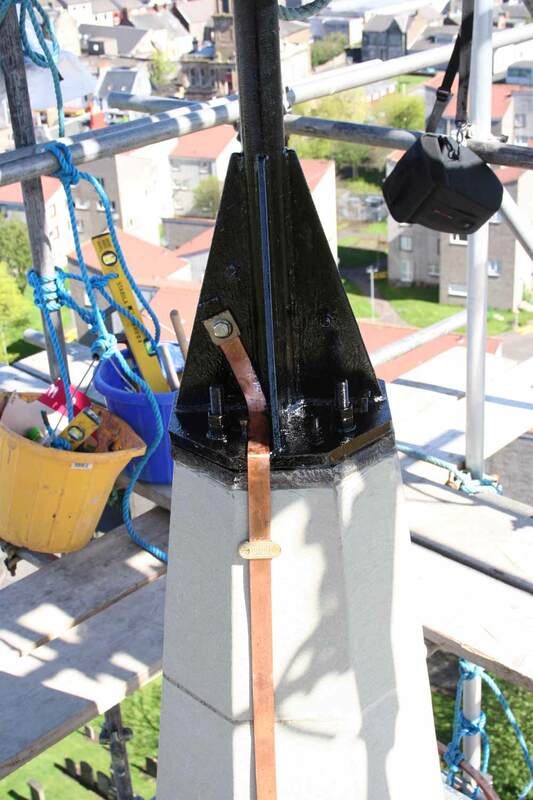 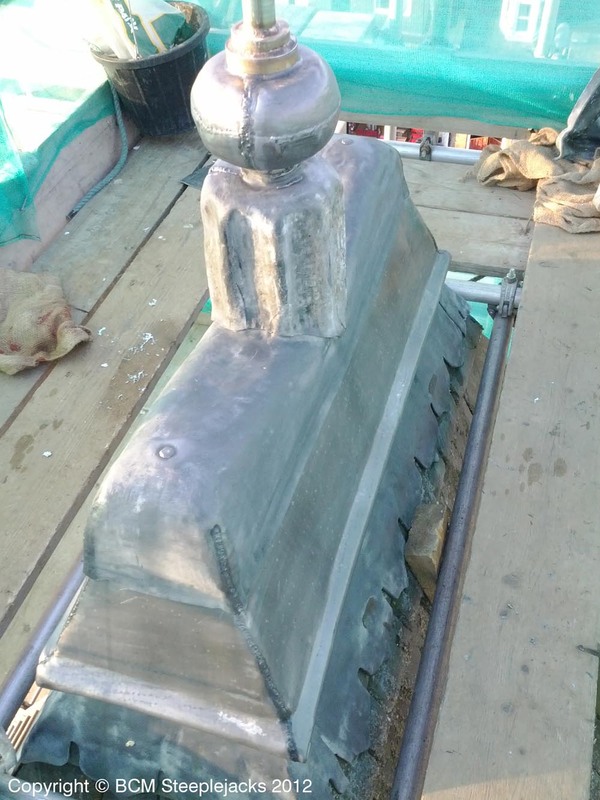 The stainless steel “compression plate” is now fully seated, the centre rod beneath is tensioned down onto the cross tree, and the finial can now be installed. 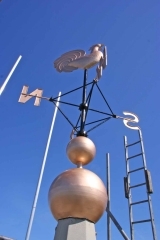 The stainless steel finial mounted and the lightning conductor bonded. 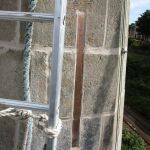 There is a 2nd lightning conductor tape on the opposite side. The cockerel and the decorative copper spheres before they were erected. 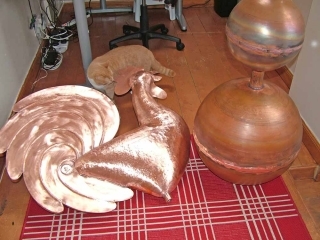 The polished copper of the cockerel has a beautiful shine but unfortunately this would have been lost as oxidation occurred, so the church opted to have them painted. 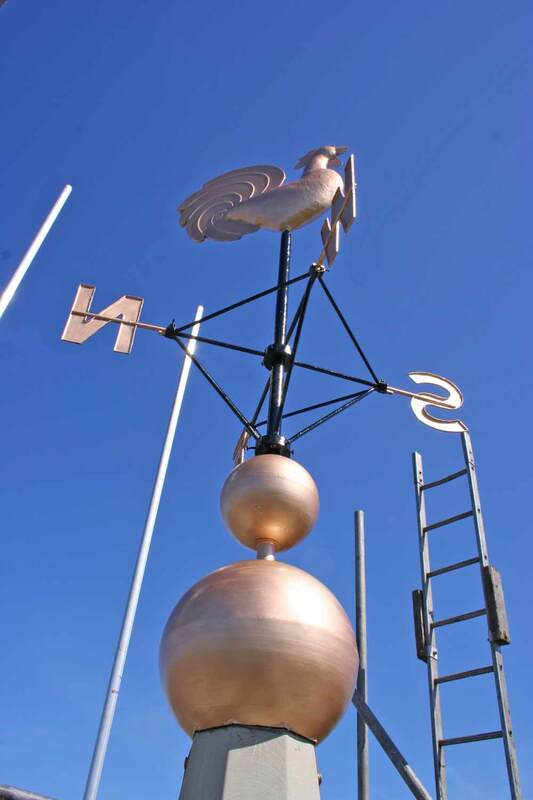 The copper balls and the cockerel are brand new, as is the stainless steel finial rod to which they are attached, and the cardinal points were refurbished. Looking up at the finial and the newly built top section of the spire after the ladders had been removed. 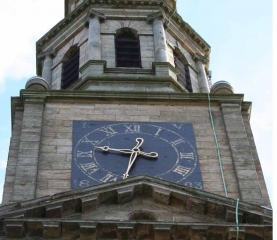 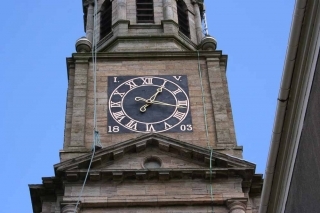 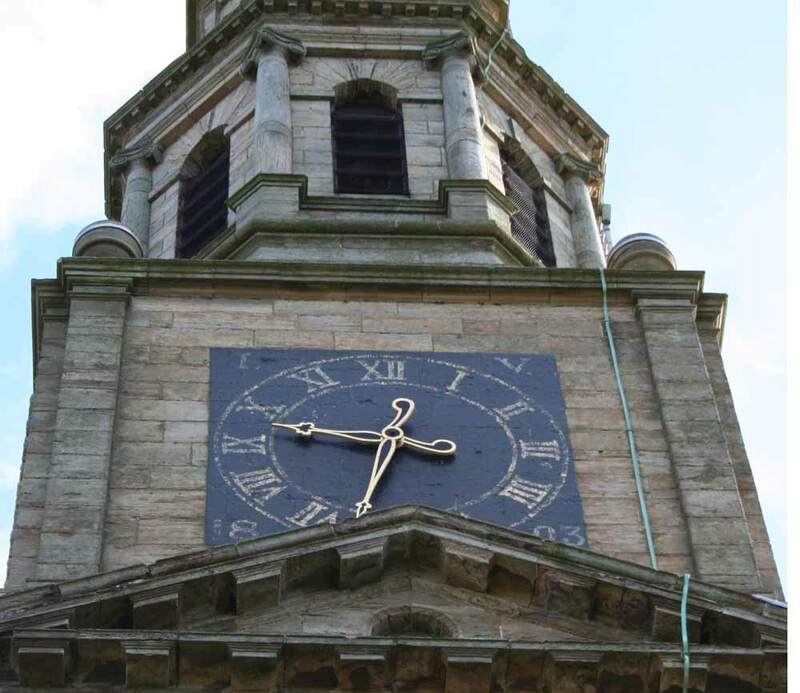 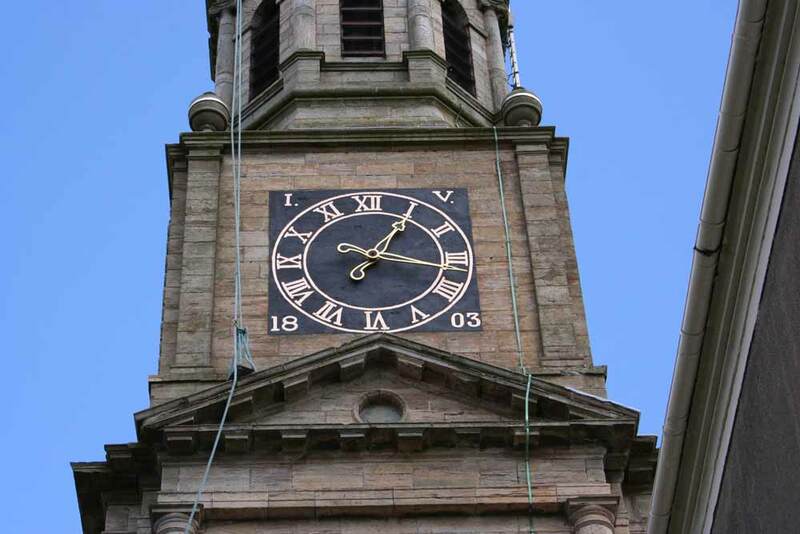 The picture below shows the clock face on the west side of the church before work started. 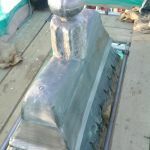 After the work was done.